The Annual Ronald Reagan Lecture illumines Ronald Reagan’s contributions to America and the world. Each year, the Institute hosts an individual who worked for, knew or has produced important work on the 40th President. Past speakers have included: Michael Reagan, Edwin Meese, Herb Meyer, Peter Robinson, Bill Bennett, Kiron Skinner, John Boyles, Art Laffer, Andrew Coffin, Peggy Grande, and more.On average, nearly 650 guests join us each year as Reagan biographer Dr. Paul Kengor (God and Ronald Reagan; The Crusader: Ronald Reagan and the Fall of Communism; The Judge: William P. Clark, Ronald Reagan’s Top Hand) interviews our guests on stage in front of a video backdrop that serves as background for discussion.In accordance with the mission of the Institute for Faith & Freedom, the goal of the Reagan Lecture is to promote the principles of faith and freedom to the next generation of American leaders. As students learn about the life and accomplishments of Ronald Reagan they can see the values of faith and freedom played out on one of the biggest political stage in the country. 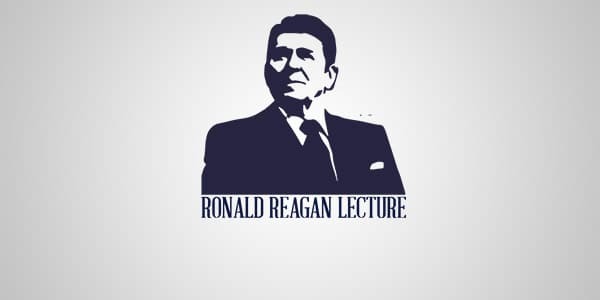 We invite you to join us for our next Ronald Reagan Lecture and to view the archives of our past lectures.